BOSTON, MA - MAY 9: Joel Embiid #21 of the Philadelphia 76ers boxes out against Aron Baynes #46 of the Boston Celtics in Game Five of the Eastern Conference Semifinals of the 2018 NBA Playoffs on May 9, 2018 at TD Garden in Boston, Massachusetts. The 76ers played 3,956 minutes during the regular season, a period during which the young, up-and-coming team exceeded all expectations. Heading into Game 5 of their Eastern Conference Semifinals series against the Boston Celtics, the Sixers had logged 445 more. Inside a disappointed visitors locker room at TD Garden, it was the few final minutes of regulation from Wednesday’s back-and-forth battle that were understandably the freshest. They were wild, featured dramatic swings, and ultimately marked the last moments of the Sixers’ breakthrough season, which ended in a 114-112 defeat. But also present on the vistor’s side of the arena Wednesday was the prevailing sentiment that despite a bitter loss, one in which it seemed like the Sixers were only a possession, or a shot, or a stop away from forcing a sixth game in South Philadelphia, undeniable progress was made, and an up-and-coming franchise succeeded in putting itself on the map. Such was the theme of the post-game message Brett Brown had for his team. “We talked about if we all sat in that room when we met back in September, and said, ‘We’re going to finish third in the Eastern conference, we’re going to lose in the Semifinals of the Eastern Conference, there’s a strong chance we all would have been hugging each other,” said Brown, upon the conclusion of his fifth season coaching the Sixers. “The initial goal was to make the playoffs. The final piece is if we’re going to do anything of any significance, we’re always going to have to go through the Boston Celtics. In this 20th post-season chapter of the longtime rivalry, an NBA record, the Sixers weren’t able to, falling four games to one. There was no masking that Wednesday’s narrow setback to archrival Boston was a bitter way for the year to end. The Sixers trailed by as many as 12 points in the second half, only to find themselves in front by four twice in the final two minutes of regulation. An impressive over-the-shoulder lay-up from Dario Saric gave the Sixers a 109-105 lead with 97 seconds left, the deposit leaving TD Garden in an uneasy state. Boston would prove that there was too much time left. Al Horford keyed the Celts’ decisive closing kick with an alley-oop slam, set up by rookie Jayson Tatum. JJ Redick missed a 3-pointer, which led to a tying tip-in from Marcus Smart. Horford, his clutch contributions helping fuel another big finish for Boston, came up with a steal on the Sixers’ next trip down the floor. Smart hit Tatum on the run for a go-ahead cutting lay-up, and TD Garden broke out in bedlam. The Sixers called time out, hoping to regroup. Joel Embiid had two chances at a potential equalizer in traffic, but couldn’t put one home, ultimately losing the ball out of bounds. After Terry Rozier increased the Sixers’ deficit to 113-109 on free throws, Redick sunk a 27-foot desperation perimeter heave, prompting the Sixers to swiftly foul Smart. With 2.4 seconds to go, Smart missed his first free throw, then tried to deliberately brick his second. Instead, he accidentally made it. On the ensuing inbounds play, Ben Simmons tossed an overhand toss from the baseline to the opposite front court corner. Smart leaped up to intercept the pass, and fired the ball back the other way as time expired. The Sixers’ remarkable, and - above all - fun ride had run out. Afterwards Wednesday’s final horn, a constantly resilient group was having trouble coming to grips with the fact that after this night, they wouldn’t be getting another shot. There was a sense of sadness born out of good times coming to a premature end, the kind that leaves eyes redder than normal. As difficult as it might have been for Redick and his teammates to find quick comfort and consolation from a season that, Wednesday night aside, yielded tremendous promise, it would be hard in the light of day to overlook the big picture that took shape over the past eight months. The realities that emerged from the 2017-2018 season were the realities, and they offer plenty of cause for encouragement. On the heels of a re-tooling project that demanded patience, the Sixers finally arrived at their moment, surging back to NBA prominence. They improved by a team-record 24 wins, and, counting the Playoffs, racked up 57 victories in all. They were among the most balanced, efficient teams in the league. Their individual pieces got better. For the Sixers, the arrow is pointing upwards, unquestionably. Beneath all the raw emotion that Wednesday’s outcome left behind, this much was understood. “We went from 28 to 52 wins,” said T.J. McConnell. He posted nine points (4-7 fg, 1-1 3fg, 5 reb, 6 ast, 2 stl, 1 tov) in his second consecutive start. The nature of sports, at all levels, is change. No two seasons produce the same team, or the same results. Players, coaches, and other staff members come and go. There’s always something different. This year, the Sixers felt they had a special group. Sure, they won, achieved even more than they probably originally thought was possible, and made history along the way. They also genuinely enjoyed each other’s company. The Sixers’ roster this season featured a collection of distinct players with wide-ranging profiles. There were the two young headliners, one with a massive personality, the other with an equally valuable calming, steadying presence. Both, however, displayed transformative talent game after game. There were the been-there-done-that veterans, who, with their respected pedigrees, brought important credibility, perspective, wisdom, and skill to the squad. There were players who fell somewhere in between, displaying that they could be dependable cogs. It all fit. On the court, and elsewhere. Between all the practices, shootarounds, and games, plenty of bonding took place, whether through organized team functions, or off-day hangouts. So, yes, in the immediate aftermath of a journey that the Sixers felt was worthy of another leg, pain and pride came hand-in-hand. Moving forward, there will be more to write for the 76ers’ story. The past campaign left us at least with that much. And it’s for that exact reason that Wednesday’s season-ending loss was so harsh. There were a couple big ones throughout the night. Boston closed Wednesday’s first half on a 19-6 tear, which set the Celtics up for a 61-52 halftime lead. With the C’s in front a game-high 12 points, 75-63, midway through the third quarter, the Sixers answered with a 19-8 run to pull within one, 83-82, heading into the fourth period. The most critical swing of all, though, came in the final 97 seconds of regulation, during which Boston outscored the Sixers 9-3 to end, and win, the game. All said and done, Wednesday’s bout had 21 lead changes and 11 ties. • Free throws - made and missed - represented an important statistical subplot in such a hard-fought affair. The Sixers and Boston were relatively even in overall field goals (Sixers 40-82 / 48.8%, Boston 38-85 / 44.7%), 3-point shooting (Sixers 8-21 3fg, Boston 7-20 3fg), and interior scoring (Sixers 54 points in paint, Boston 48). But the stripe was where a considerable disparity in the final box score could be found. The Sixers went 24 for 31 from the line (77.4%), while the Celtics finished Wednesday’s contest 31 for 41 (75.6%). In a game decided by two points, those numbers stood out. • With Shane Larkin sidelined (shoulder sprain), and Boston needing an extra ball-handler for its second unit (Marcus Smart), Jaylen Brown made his first appearance of the series in the Celtics’ starting line-up. He provided a considerable spark, scoring six of the C’s first eight points of the evening, with a rebound and blocked shot sprinkled in between. Brown hit timely jumpshots in the third quarter to preserve Boston’s lead, then nailed a long 2-pointer and a 3-pointer within the first 70 seconds of the fourth frame to keep the Celtics narrowly in front. Brown, the 2016 no. 3 pick, missed Game 1 of the East Semis with a hamstring issue. His 24 points Wednesday (10-13 fg) marked a personal-high for the series. • JJ Redick dubbed Dario Saric a “warrior” when describing the Croatian’s performance in Game 5. The designation was appropriate, as the Sixers’ power forward tallied 27 points and 10 rebounds for his first career double-double in the Playoffs. His 27 points and 10 boards also established new personal single-game highs in the post-season. After needing a few games to find his rhythm, Saric finished the second round by totaling 52 points his final two games (17-31 fg, 4-6 3fg). He proved increasingly effective as an interior post-up weapon. Joel Embiid was a force in Wednesday’s third quarter, and was very much responsible for a run that propelled the Sixers back within striking distance. At one point, he scored seven points in a row for the Sixers, en route to manufacturing 11 points (3-4 fg, 5-7 ft), plus five rebounds, for the period. Boston made life difficult for Embiid in the fourth frame, holding the center to four points on 1 for 6 shooting. In the end, echoing similar statements made by teammates, Embiid said he felt he had more to give. Ben Simmons cranked out historic, never-before-seen numbers for a rookie during the regular season. He was in rare company again in the Playoffs, averaging 16.3 points, 9.4 rebounds, and 7.7 assists in 10 post-season games. Magic Johnson is the only other first-year player in NBA history to produce those playoff minimums. Wednesday, Simmons looked back on his debut campaign with unsurprisingly measured perspective. For all but six members of the Sixers’ roster, this year’s Playoffs marked their first foray into post-season play. Dario Saric made it sound like the Playoffs were a lesson in margin for error. 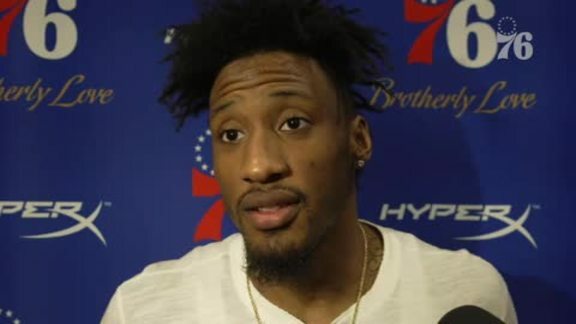 Robert Covington said that details like taking better care of the ball, taking good shots, and executing proper defensive rotations were all finer details that added up. Joel Embiid, on the Sixers’ season. Jaylen Brown, on the Game 7 mentality that Boston adopted for Game 5. 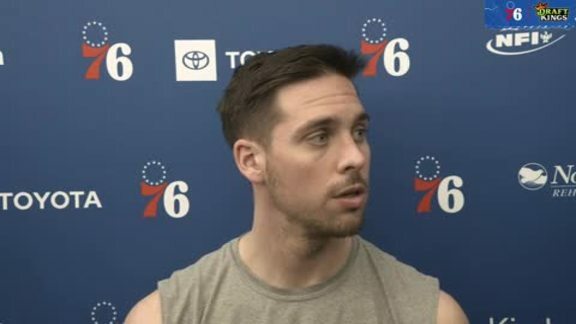 T.J. McConnell, on Wednesday’s loss, and the Sixers’ season. Playing all 12 minutes of Wednesday’s third quarter, Joel Embiid was a major driving force behind the Sixers’ comeback bid. The Sixers made a concerted effort to get the All-Star inside, and in this sequence, he was set up by fellow big man Ersan Ilyasova.